Web-fed offset lithographic press at speed. One of the most important functions in the printing process is prepress production. This stage makes sure that all files are correctly processed in preparation for printing. This includes converting to the proper CMYK color model, finalizing the files, and creating plates for each color of the job to be run on the press. Every printing technology has its own identifying marks, as does offset printing. In text reproduction, the type edges are sharp and have clear outlines. The paper surrounding the ink dots is usually unprinted. The halftone dots are always hexagonal though there are different screening methods. 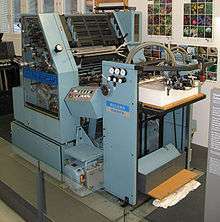 The most common kind of offset printing is derived from the photo offset process, which involves using light-sensitive chemicals and photographic techniques to transfer images and type from original materials to printing plates. In current use, original materials may be an actual photographic print and typeset text. However, it is more common—with the prevalence of computers and digital images—that the source material exists only as data in a digital publishing system. The inking and dampening systems deliver ink and water onto the offset plate covering the plate cylinder. The plate cylinder transfers the ink onto the blanket covering the offset cylinder. The paper is then pressed against the offset cylinder by the impression cylinder, transferring the ink onto the paper to form the printed image. The goal of any inking system is to place a uniform layer of ink across every dimension of the printing plate. 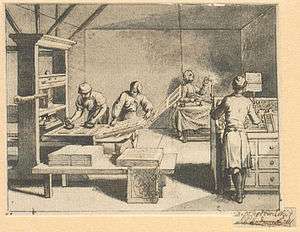 The lithographic process is unique in that it requires the ink form rollers to pass in contact with the nonimage areas of the plate without transferring ink to them. The ink fountain stores a quantity of ink in a reservoir and feeds small quantities of ink to the distribution rollers from the ink fountain roller and the ink ductor roller. The ink ductor roller is a movable roller that moves back and forth between the ink fountain roller and an ink distribution roller. As the ductor contacts the ink fountain roller, both turn and the ductor is inked. The ductor then swings forward to contact an ink distribution roller and transfers ink to it. There are generally two types of ink distribution rollers: the ink rotating rollers (or ink transfer rollers), which rotate in one direction, and the ink oscillating rollers (or ink vibrating rollers), which rotate and move from side to side. The ink distribution rollers receive ink and work it into a semiliquid state that is uniformly delivered to the ink form rollers. A thin layer of ink is then transferred to the image portions of the lithographic plate by the ink form rollers. The ink fountain holds a pool of ink and controls the amount of ink that enters the inking system. The most common type of fountain consists of a metal blade that is held in place near the fountain roller. The gap between the blade and the ink fountain roller can be controlled by adjusting screw keys to vary the amount of ink on the fountain roller. The printer adjusts the keys in or out as the ink fountain roller turns to obtain the desired quantity of ink. In simple presses, the printer must turn these screws by hand. In modern presses, the adjusting screws are moved by servomotors which are controlled by the printer at a press console. Thus the printer can make ink adjustments electronically. If the printer needs to increase or decrease ink in an area of the plate (print), he need only adjust the needed keys to allow more or less ink flow through the blade. The ink flow can also be controlled by the rotation velocity of the ink fountain roller. A simple indication of the quality of a printing press is the number of distribution and form rollers. The greater the number of distribution rollers, the more accurate the control of ink uniformity. It is difficult to ink large solid areas on a plate with only one ink form roller. With three (generally the maximum), it is relatively easy to maintain consistent ink coverage of almost any image area on the plate. Business forms presses, which print very little coverage, usually only have one or two ink form rollers. Because of this, they cannot print large solid or screen images. Smaller, less sophisticated presses also have the same problem, however, many of the newer presses today are being equipped with larger, better inking systems to meet the growing print demands of the consumer. Most lithographic plates function on the principle of water and ink receptive areas. In order for ink to adhere only to the image areas on the plate, a layer of moisture must be placed over the nonimage areas. The dampening system accomplishes this by moistening the plate consistently throughout the press run. Direct dampening systems employ a water fountain roller which picks up the water from the water fountain. The water is then passed to a water distribution roller. From here the water is transferred to the offset plate via one or two water form rollers. Indirect dampening systems (or integrated dampening systems) feed the water directly into one of the ink form rollers (ink rollers that touch the offset plate) via a water form roller in contact with it. 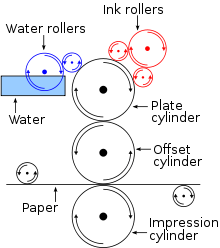 These systems are known as "indirect" since the water travels to the offset plate passing through the inking system and not directly to the offset plate as direct systems do. Some indirect systems will have the ability to feed the water into the inking system as well as to the offset plate. A fine emulsion of ink and water is then developed on the ink form roller. This is one reason printers need to know about "water pickup" or what percentage of water can be taken up by the ink. These systems are also known as "integrated" dampening systems as they are integrated into the inking system. One of the benefits of these systems, is that they do not use covers thus they react quicker when dampening changes are made. One generally finds this type of dampening systems on newer and faster press equipment today. Intermittent-flow dampening systems (direct or indirect) use a water ductor roller to pick up the water and transfer it to a water distribution roller. A drawback of these systems is the slow reaction time in making adjustments due to the back and forth action of the ductor. Continuous-flow dampening systems (direct or indirect), are used by most newer presses today because they do not have the slow reaction time of intermittent-flow dampening systems. They do not employ the water ductor roller but use the water slip roller (a roller in contact with both the water fountain roller and a distribution roller, contrary to the water ductor roller that moves back and forth between the two) for a continuous flow. The speed of the water slip roller controls the supply. The use of alcohol on these type of dampeners was standard for years. Alcohol (isopropyl alcohol) was used as it increased the water viscosity and made it "more wettable" so that transfer was easier from one roller to the other. However, alcohol substitutes such as glycol ethers, butyl cellusolve, etc., are being used today to accomplish the same task because alcohol contains volatile organic compounds. Roller hardness is also being changed to help accomplish the same job—easy transfer of the water. 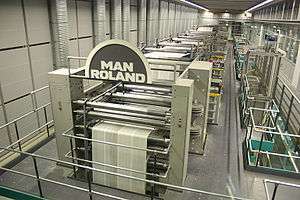 dry offset printing, a printing process which uses a metal backed photopolymer relief plate, similar to a letterpress plate, but, unlike letterpress printing where the ink is transferred directly from the plate to the substrate, in dry offset printing the ink is transferred to a rubber blanket before being transferred to the substrate. This method is used for printing on injection moulded rigid plastic buckets, tubs, cups and flowerpots. The paper is visually inspected to make sure there are no rips or damaged pieces of paper. The chemical plate is checked so that there is a right amount of chemical solution applied to the plate so that when the offset cylinder touches the paper that there aren't any smudges. During the printing process an operator has to check that there is no smudging between two or more sheets, where the ink is just coming off. If this does happen then quicker drying ink or a higher quality paper is required. After the printing has taken place there has to be a check for quality on colour, image, shapes and type and other preference. Quality control of the registration marks ensures that any colours produced beyond the edges of the bar are corrected immediately. A printing colour for each colour means that this could easily go wrong if a plate is not set up to a precision, meaning it will look out of focus and blurry. polyester plates, these are much cheaper and can be used in place of aluminum plates for smaller formats or medium quality jobs, as their dimensional stability is lower. Most CTP systems used thermal CTP or violet technologies. Both technologies have the same characteristics in term of quality and plate durability (longer runs). However often the violet CTP systems are cheaper than thermal ones, and thermal CTP systems do not need to be operated under yellow light. Thermal CTP involves the use of thermal lasers to expose and/or remove areas of coating while the plate is being imaged. This depends on whether the plate is negative, or positive working. These lasers are generally at a wavelength of 830 nm, but vary in their energy usage depending on whether they are used to expose or ablate material. Violet CTP lasers have a much lower wavelength, 405 nm–410 nm. Violet CTP is "based on emulsion tuned to visible light exposure". Production or impact of double image in printing is known as slur. Web offset presses are beneficial in long run printing jobs, typically press runs that exceed ten or twenty thousand impressions. 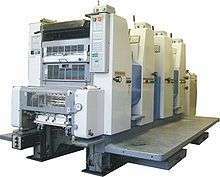 Speed is a determining factor when considering the completion time for press production; some web presses print at speeds of 3,000 feet per minute or faster. In addition to the benefits of speed and quick completion, some web presses have the inline ability to cut, perforate, and fold. Fountain solution is the water-based (or "aqueous") component in the lithographic process that moistens the non image area of the plate in order to keep ink from depositing (and thus printing). Historically, fountain solutions were acid-based and made with gum arabic, chromates and/or phosphates, and magnesium nitrate. Alcohol is added to the water to lower the surface tension and help cool the press a bit so the ink stays stable so it can set and dry fast. While the acid fountain solution has improved in the last several decades, neutral and alkaline fountain solutions have also been developed. Both of these chemistries rely heavily on surfactants–emulsifiers and phosphates and/or silicates to provide adequate cleaning and desensitizing, respectively. Since about 2000, alkaline-based fountain solutions have become less common due to the inherent health hazards of high pH and the objectionable odor of the necessary microbiological additives. Offset lithography became the most popular form of commercial printing from the 1950s ("offset printing"). Substantial investment in the larger presses required for offset lithography was needed, and had an effect on the shape of the printing industry, leading to fewer, larger, printers. The change made a greatly increased use of colour printing possible, as this had previously been much more expensive. Subsequent improvements in plates, inks, and paper have further refined the technology of its superior production speed and plate durability. Today, lithography is the primary printing technology used in the U.S. and most often as offset lithography, which is "responsible for over half of all printing using printing plates". The consistent high quality of the prints and the volume of prints created for their respective cost makes commercial offset lithography very efficient for businesses, especially when many prints must be created. Odor free offset printing is the newest technology. ↑ "offset printing (printing technique) - Encyclopedia Britannica". Britannica.com. Retrieved 2013-11-24. 1 2 3 4 5 6 7 Meggs, Philip B. (1998). A History of Graphic Design (Third ed.). John Wiley & Sons, Inc. pp. 146–150. ISBN 978-0-471-29198-5. 1 2 3 Howard, Nicole (2005). The book: the life story of a technology. Greenwood Publishing Group. pp. 140–148. ISBN 0-313-33028-X. ↑ "Rubel Offset Lithographic Press". HistoryWired: A few of our favorite things. Smithsonian Institution. Retrieved 30 Sep 2012. ↑ "Short History of Offset Printing"
↑ Kipphan, Helmut (2001). Handbook of print media: technologies and production methods (Illustrated ed.). Springer. p. 354. ISBN 3-540-67326-1. ↑ "Printing Process Explained - Lithography". Dynodan.com. Retrieved 2012-11-15. ↑ Johansson, Kaj; Lundberg, Peter; Ryberg, Robert (2007). A guide to graphic print production (second ed.). Wiley. p. 353. ISBN 0-471-76138-9. ↑ "What is Offset Printing"
Hird, Kenneth F. Offset Lithographic Technology. Tinley Park, Ill: Goodheart - Willcox Co, 2000. ISBN 978-1-56637-621-1.